AIR POWER SYSTEMS 60 February/March 2018 unmanned systems inside Photos courtesy of Insitu. W hen one of PINC's inventory drones canvasses a large ware- house, it moves up and down long aisles as it collects and relays information about the thousands of products it scans. These expansive missions take time to complete—which is why it's so im- portant to deploy unmanned aircraft systems (UAS) capable of long flights. About six months ago, PINC CEO Matt Yearling and his team began testing a power source known for its longer endurance: a hydrogen fuel cell system from Intelligent Energy. With this system, Yearling doesn't have to worry about the drone running out of battery life mid-job and then needing to recharge. Instead of f lying for 30 minutes, the hydrogen- powered prototype can f ly for two or three hours, and it only takes a few minutes to refuel or swap out a tank once it's empty. Hydrogen also pro- vides a greener, safer solution than batteries, Yearling said, and is starting to be used more and more in the material handling supply chain, making it an attractive option for PINC. "For us, longevity of operation is key," Yearling said. 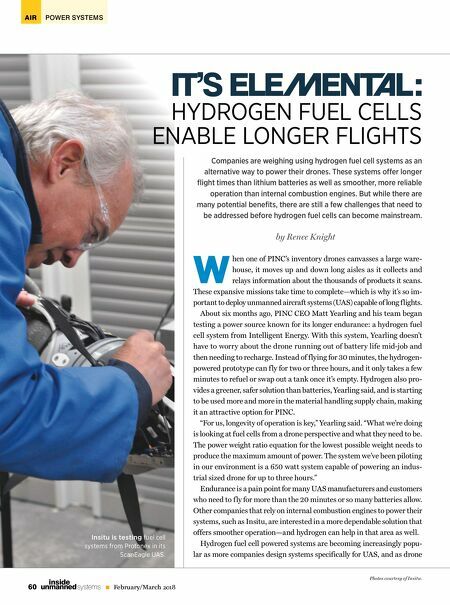 "What we're doing is looking at fuel cells from a drone perspective and what they need to be. The power weight ratio equation for the lowest possible weight needs to produce the maximum amount of power. The system we've been piloting in our environment is a 650 watt system capable of powering an indus- trial sized drone for up to three hours." Endurance is a pain point for many UAS manufacturers and customers who need to f ly for more than the 20 minutes or so many batteries allow. Other companies that rely on internal combustion engines to power their systems, such as Insitu, are interested in a more dependable solution that offers smoother operation—and hydrogen can help in that area as well. 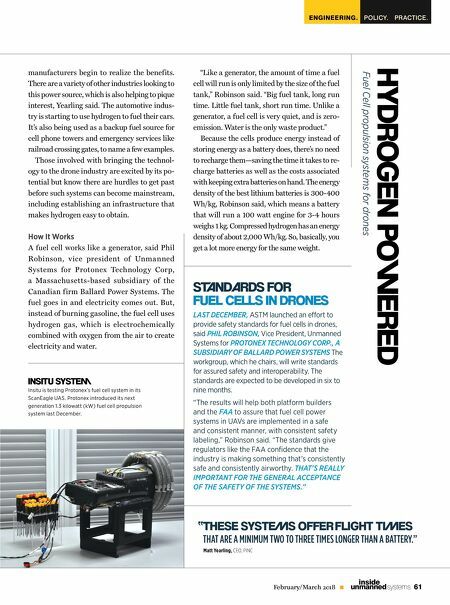 Hydrogen fuel cell powered systems are becoming increasingly popu- lar as more companies design systems specifically for UAS, and as drone Companies are weighing using hydrogen fuel cell systems as an alternative way to power their drones. These systems off er longer fl ight times than lithium batteries as well as smoother, more reliable operation than internal combustion engines. But while there are many potential benefi ts, there are still a few challenges that need to be addressed before hydrogen fuel cells can become mainstream. by Renee Knight IT'S ELEMEN L: HYDROGEN FUEL CELLS ENABLE LONGER FLIGHTS Insitu is testing fuel cell systems from Protonex in its ScanEagle UAS.